The First peal attempt on the new twelve. The two new trebles were delivered to the Cathedral on Friday 2nd December by Nathan Colman who is now working for Taylors. Assistance from the Norman Tower work gang quickly saw the treble bell given by the Vestey family quickly set on the trolley as the vergers opened the South door and set the ramps in position. Minutes later the bell and headstock were set down by the wrought iron gates leading to the Lady Chapel altar. Five minutes later and the Stannard bell sat near it. Lifting tackle removed and pictures taken the Cathedral was cleared and the vergers brewed us a well earned cuppa. The bells will remain on display until dedicated in early March so ringers will have a good chance to see the bells on the deck before they are lifted into the extension frame to complete the 12. On Thursday 15th September a group of 26 people left Ram Meadow car park on a mini coach to travel to Taylors of Loughborough to watch the casting of the two new trebles for The Norman Tower. There was a mixture of people on board, some ringers, ex ringers, cathedral staff and friends. A small contingent had joined us from Ipswich including George Pipe, who only recently released from hospital, was in amazingly good spirits and it was great to have him with us. We were joined at Loughborough by 5 more ringers and two old friends from Kent, Paul Stannard’s mother, Janet and her husband Godfrey. There was an air of great anticipation coupled with a feeling of awe and also achievement. We had not expected to be at this point in the augmentation project so soon. The casting was not scheduled until 2.30 so we had arranged to ring at Loughborough (in the words of Suffolk Guild’s new Ringing Master “probably the world’s finest ten” but then he would be ever so slightly biased!). They were a delight to ring though and after such exercise we needed to top up our fuel reserves by visiting The Three Nuns pub for lunch. This is undoubtedly one of the many local institutions that were relieved when Taylor’s started trading again. They are close to the foundry and produce some excellent food at good prices. No wonder they are recommended by the many ringers who have eaten there. At 1.30 we were greeted at the foundry by Richard Grimmet and George Dawson and George gave an excellent guided tour of the museum and the foundry. Even though many of us had been the previous year for a tour we all learnt something new. The youngest member of the party Christopher from Bardwell was used as a teacher’s assistant by George, and he needed no encouragement to hit the display bells with a wooden mallet. The moment we had all been waiting for soon arrived and we assembled in the viewing gallery to watch our two new trebles being cast. The ladle was loaded with molten bell metal and moved across on the cradle hoist to the area where the bell moulds were sunk in the floor and then….. the foundry men went for a cup of tea!! This apparently is a vital part of the proceedings because the ambient high temperature near the men dries them out very quickly! 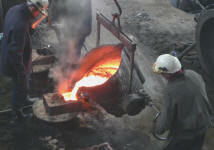 Within a few minutes though we stood in almost silent wonder watching the river of molten metal pouring into the two moulds, the most noticeable sound was the rapid clicking of camera shutters as like an artillery of shotgun sights their lenses were trained on the mouth of the ladle as the fire came pouring out. Once this most dangerous part had been completed the group were allowed down onto the foundry floor where George continued his very informative guided tour. The whole day was very enjoyable and I am sure that I am not alone in feeling very privileged in being able to witness such a wonderful event in the augmentation project. The bells will be removed from the moulds after five days and very soon will be on a lorry being transported to St Edmundsbury Cathedral, where they will be on public view for a short time before joining their ten fellow sonorous choir members in the Norman Tower Belfry.